Albert Einstein, Marilyn Monroe, Joe DiMaggio and Senator Joe McCarthy walk into a hotel room. Stop me if you think you've heard this one before. First performed in 1982 (and adapted into a 1985 movie), Terry Johnson's Insignificance imagines a fictional encounter between the 20th century's twin ideals of beauty and brains, with the shadow of government persecution, nuclear war and the dehumanising effects of celebrity hanging over them. We meet Einstein (Simon Rouse) working away at his theories in a New York hotel room. The action kicks off when McCarthy rudely intrudes and begins non-too-subtly grilling him on what his testimony will be. Soon after his departure, Marilyn Monroe (Alice Bailey Johnson) arrives, fresh from filming her iconic skirt blowing in the air scene on the corner of Lexington Avenue. Thousands gathered to get a look at her legs, to the intense displeasure of her then-husband, ballplayer Joe DiMaggio (Oliver Hemborough). Johnson's play gets its kicks from pairing these people off against one another and continually shuffling them into different configurations. Each character embodies primal forces: intelligence, beauty, power and strength, and each jockeys for a prime position throughout the play's ponderous yet pointed spiels on relativity, celebrity and dignity. Insignificance is a curiously meandering piece of drama, content to sit back and see what happens when these characters rub up against one another. Some tension is provided by Einstein's impending appearance before HUAC, but for long stretches of the play this fades into the background and (given that we know the real-life history) the conclusion isn't really in doubt. What remains is a pleasant but light play in which the primary pleasure comes from watching friendly old Einstein dealing with a frayed Monroe with grandfatherly kindness. The obvious highlight comes early on, when Monroe wants to prove to Einstein that she's not just a pretty face and delivers an energetic and accurate explanation of relativity via toy trains, Mickey and Donald and a couple of balloons. Other than that, Insignificance is a comedy that gently amuses rather than makes you actually laugh. It feels a bit like something you'd catch on a rainy Sunday afternoon on Channel 4 - untaxing, easy-going and basically good-natured, but not exactly going to set anyone's world on fire. Don't get me wrong, there is some meat on these bones - the play has quite a lot to say on Einstein's guilt at contributing to nuclear weapons development, Monroe's fractious relationship with her public persona, DiMaggio's masculinity and McCarthy's bizarre self-centred egomania - but these strands never quite bind together into coherence. All this makes it hardly a chore to watch, especially when it comes to the cast. Performing Einstein or Monroe is a tough job for any actor; they're both so firmly established in the public consciousness that even an accuracy can feel like caricature. But Bailey Johnson and Rouse both elevate the characters beyond mere mimicry and find their kernel of basic, empathetic humanity. There are worse ways to spend a couple of hours at the theatre than Insignificance. It's a nicely turned out, well-performed play with a smattering of successful moments and some interesting (but fuzzy) things to say about the world (I guess it has relevance to contemporary events if you squint a bit). Fun, but hardly essential. 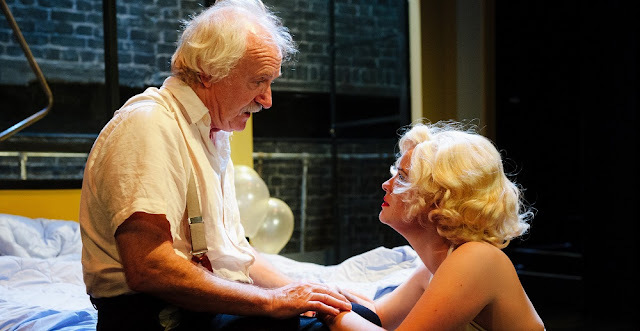 Insignificance is at the Arcola until 18 November. Tickets here.